Today's FP "NPoCP" is a Toyota not-Tacoma pickup truck stuffed chock-full of Supra turbo bits. It could be a proper sleeper were it not for the enormous intercooler where roughly 50% of the front bumper used to be. Neat truck, but not as subtle as it could be, and certainly a strong CP at the $15k ask. But what about something for about half that price? 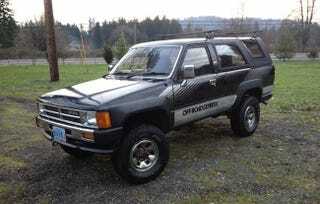 This 1989 Hilux Surf (4Runner to you and me, bubba) in Portland, Oregon is not only right-hand drive, not only a manual, but also a diesel! Sure, it's not brown, and sure it has no back bumper. But it does have a bunch of work done, including a new head/head gasket and a rebuilt injection pump. It also has the removable roof, which on a diesel could go either way, but I'm chalking that up in the Good column. The chassis has about 164k miles on it, and while the body looks pretty good there's no mention of rust or anything else going on underneath the truck. I found it on the Minneapolis Craigslist site while searching for local 4Runners with manual transmissions. This guy is clearly posting all over the place. I love these first-gen 4Runners, but it's far too nice to be put into daily service here in the North Woods, not to mention the fact it probably wouldn't start four or five months out of the year. What do we think, Oppo? NP or CP?